A new study states that diluted bitumen, a raw material used as a feedstock in oil refineries, turns into a “heavy, viscous, particle-laden residue” after days of exposure, say, in ocean water after an incident like the Refugio Oil Spill. That’s not unlike the type of oil found on the beach and in the water by the people who attempted to restore the shore this past May. 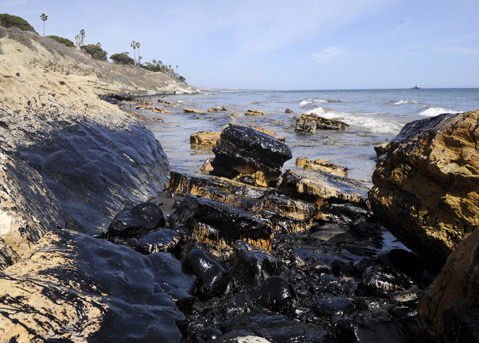 The heavy crude that befouled Refugio may not literally be diluted bitumen, explained UCSB geochemist David Valentine, but it has characteristics that are more like diluted bitumen than the lighter oils to which current spill response is tailored. For instance, heavy crude tends to sink — instead of floating on the surface as medium and light crudes do — and it is very sticky. Valentine is among the authors of the paper and also a scientist researching the aftermath of Refugio, which gave a first-hand case study of spill response. The study advises that federal agencies widen their response protocols to deal with heavy crudes and that the agencies and local government increase coordination, share lessons learned, improve planning, and conduct joint exercises. The study points out that the Pipeline and Hazardous Materials Safety Administration (PHMSA) could benefit from these approaches but is hampered by its lack of authority to respond to spills. The checklist PHMSA uses to approve spill response plans for pipelines might determine completeness, which is all it is required to do, but the method is a weakness, the study states. Because the agency does not use field staff, as Coast Guard and Environmental Protection Agency do, to examine the adequacy of rupture plans, the paper expresses concern that pipeline response plans lack the strategies needed for unique terrain, for instance environmentally sensitive areas, in a bitumen spill. The environmental risks of crude oil transport have been recognized since Santa Barbara’s blowout in 1969, the study says, and the 2010 bitumen spill into Michigan’s Kalamazoo River, among others, caused the Department of Transportation (DOT) to ask scientists if the potential environmental consequences of a bitumen spill were significantly different from a spill of light or medium crude. Often extracted from tar sands, bitumen is too viscous to flow readily through pipelines, and oil producers commonly dilute it with lighter oils or condensed natural gas for pipeline transport. The study, titled “Spills of Diluted Bitumen from Pipelines: A Comparative Study of Environmental Fate, Effects, and Response,” explains that “weathering” causes rapid physical and chemical changes to diluted bitumen after a spill, making it stickier and more dense than water. The heavy crude from Canadian tar sands is commonly diluted, and the study lays out the Keystone pipeline proposal to move crude from Canada and other existing and proposed pipelines around the nation. (Though the study states the majority of California’s crude is moved through heated pipes, in Santa Barbara County, the main transport pipelines are insulated, not heated, and carry oil that has been heated and blended with natural gas liquids, according to the county’s Energy Division.) The report, prepared for the DOT and published by the National Academies of Sciences, Engineering, and Medicine, also states its findings translate to transport such as truck and rail. Given the new information about diluted bitumen, the report makes recommendations that the Coast Guard reclassify the substance as a nonfloating oil and that the National Oceanic and Atmospheric Administration (NOAA) create a database to predict possible locations of future bitumen spills. It further advises the Pipeline and Hazardous Materials Safety Administration (PHMSA), which is a branch of the DOT, to modify transport rules to recognize the special hazards presented by diluted bitumen.